This is a nice clip of Louis Armstrong (and amazing band) playing ‘Dixie Music Man’ from the 1947 film New Orleans. The woman with the flowers in her hair is Billie Holiday. The band features Kid Ory, Bunny Berigan and Zutty Singleton (with others) – musicians I’ve been following through a range of bands lately. This clip was posted by Rayned on faceplant, and it’s timely because I’m obsessed by Armstrong and Holiday at the moment. Yesterday I photocopied all the bits of the Discography referring to Holiday. I’m not going to even try that with Armstrong – there’s an entire, huge book devoted to his recordings alone. It’s fascinating to follow these guys through different bands. Both were really amazing musicians with a sense of swing that’s really incomparable. You can pick Armstrong’s trumpet in any recording, no matter how crappy and crackly. and Billie… her later stuff is really tricky to dance to because she’s so clever with phrasing and timing. Sometimes she’s so way, way back there behind the beat you’re sure she’s just about to be out of time completely. I like listening to the way she shapes a band when she’s singing with them – with live recordings. 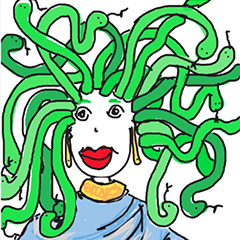 She can work around a straight, uptight band and make them sound like they’re actually hot. Same goes for Louis – these guys have a sense of timing that’s impeccable. Like really good comedians. For my money, Armstrong was really rocking with this small groups in the late 20s. This was a collection of great New Orleans jazz musicians, many of whom began with King Oliver, and most of whom moved on to Chicago and then New York (and further afield). I’m a massive fan of Kid Ory, but I’m also digging Zutty Singleton. I’m a bit of a nut for rhythm sections generally (I think it’s because I listen to this stuff as a dancer), and Singleton just keeps popping up in the bands I like. I was a little sceptical of the claims made about Armstrong’s Hot fives and sevens until I actually sat down and listened to them in chronological order – after the stuff he did supporting singers like Bessie Smith (! powerhouse combo, much? An example: St Louis Blues 1925)), after his work with King Oliver. But before his Orchestra stuff of the 1930s (some of which is a bit dodgy, I’ve found). I’m not really interested in his stuff after the 50s (though I bet I’ll change my mind on that too), and I really don’t like ‘Hello Dolly’ and all that vocal rot. I quite like him doing nice, silky groovy duets with Ella Fitzgerald (many of which included Oscar Peterson), but my real interest in his music is in his late 20s and early 30s stuff when you really hear his approach to timing and nuance signaling musical change: the swing era’s coming. But nobody else is really there yet. These Hot Five and Seven bands were really one of the the first real opportunities for Armstrong to experiment with music and musicians on his own terms in his own bands. I think the smaller group allows the sort of group or ensemble improvisation that you just can’t keep under control with a big band. The best example of this sort of improvisation usually comes in the final chorus when it sounds as though everyone’s doing their own thing (because they are), but are still working together, playing within a particular framework. That’s the sort of thing I LOVE as a dancer and DJ because it reminds me of lindy hop – improvisation within structure. I love playing this sort of stuff for dancers because the energy suddenly leaps in that final chorus, and you can end a song (or a set) on a high energy point. I especially love Fats Waller for this. He might begin with a quieter song whose clever lyrics make you listen up carefully, but he ends with a loud, raucous shouting chorus that makes you bust out like a fool on the dance floor. 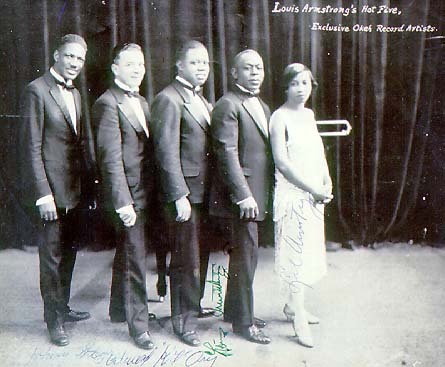 In a smaller group, Armstrong lets the musicians play in their own ways, but still works as the lynchpin in a fairly complicated musical machine. The ensemble improvisation allows each musician to shine with improvisation, but still maintains a sense of group or collaborative wholeness; it’s not just random noise. 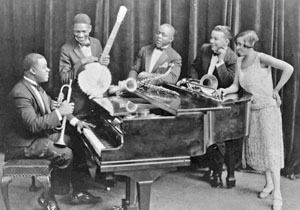 The musicians were all amazing, including Louis Armstrong on trumpet, Lil Hardin (who became Lil Hardin Armstrong) on piano, Johnny Dodds on clarinet, Kid Ory on trombone and Johnny St. Cyr on banjo. The band’s membership changed a little, and the group also recorded as the Hot Seven (there are a range of other names for similar groupings, including a special Savoy small band). Additional musicians included Kid Ory (cornet), Lonnie johnson (guitar), Earl Hines (piano), Zutty Singleton (drums) and a few different vocalists (May Alix is one who catches my eye because she also did work with Jimmie Noone, who I love). The Hot Fives and Sevens recorded between 1925 and 1928 (you can read more about the Hot 5 here on redhotjazz.com). I really like this recording of ‘Fine and Mellow’. The musicians are, of course, amazing. It’s from 1957, when Billie was already more than a little trashed by drugs and alcohol. But she really was a phenomenal singer. Even as her voice became more and more ragged, her technique and sense of music were indefatigable. The Decca collection liner notes mention that she was the sort of musician (or artist is the term I think they use) who used one or two takes to record songs. She could simply get it right the first time. As the liner notes say, she had an idea of how she was going to do the song, and then she did it. Holiday didn’t have the length of career that Armstrong did (he was recording from 1923 (at least) til 1971), she had only a couple of decades), but her music spread from that hot, swinging jazz moment in the 30s and the pop/ballad/jazz feel of the 50s and 60s. And of course, I’ve just written a post which presents the history of ‘jazz’ in terms of two ‘artists’. But I think it’s important to note that Armstrong’s Hot Five were just that – five (or seven, or six) musicians working together. The collective improvisation is really important, this isn’t the showcasing of solos of the swing era. This is a group of people working and listening together to make something together. Holiday’s work as a vocalist was primarily as a response to the bands and musicians she was working with. Her close friendship with Lester Young is perhaps the best example. There’s plenty of anecdotal (and evidence based) discussion of their musical collaboration as a process of listening to and learning from each other. Young is often quoted as being most inspired by vocalist’s technique. Holiday is often referred to as emulating Young’s saxophone technique. Their musical relationship was indubitably one of collaboration and mutual inspiration. After all, it’s very difficult to be a jazz musician all on your own.